It only feels like five minutes since I wrote Alexander's 4 months update, but here I am writing about month 5! Before I know it it will be his half birthday!! So now he is really starting to discover himself and what he can do! He absolutely loves little games in the mirror, his reaction to himself is just the cutest thing. He will look, smile, get excited and then go all coy burying his face in my chest and peek back out at himself from the side! Really quite funny. This month he has discovered toys and has started intentional play. He seems especially fascinated by his Pirate Octopus and grab rattle ball! Although toys are not essential; he will happily explore bibs, muslins and blankets intently too, anything he manages to get his hands on really! He loves his latest 'big toy' too which we've picked up for him - the Jumperoo. Our living room is increasingly looking like a Toys 'R' Us superstore! I love watching him explore his new skills, cause and effect is emerging now! If the video works it captures him discovering he can spin the lizard on the jumperoo to make a noise for the first time! Last month he was just beginning to pull himself to sitting with a little prompt and support, now when he is sat against you on your lap, or in a reclined chair (e.g. carseat or swing) he is leaning himself forward in an attempt to pull himself to straight sitting, he doesn't want to be sat back as it were. When sitting on the floor between my knees he will lean himself forward onto his arms and hold the sitting position almost independently for a few seconds. It is amazing to think that merely five months ago he was a helpless floppy newborn and now has enough tone to begin to sit, be supported to stand for a few seconds and begin to move. A fortnight ago Alexander discovered he could move a little bit on the floor. Led on his tummy he huffed and puffed until he had managed to turn himself around 90 degress; ok so he still hasn't grasped rolling over but he has grasped movement. Just a few days ago, on the floor on his back he spent half and hour developing his technique of moving himself around; this time around in a full circle. It involved rolling onto his side, stretching his head right back and pushing with his feet! Amazing to watch, I wish I'd thought to get video of that too! Although no doubt I'll be told to jokingly watch out now over the coming few months as he discovers he can be mobile I'm just in awe at how quickly he is learning to do things and how quickly he is changing. Of course he is growing again. A few weeks ago the time came to change our pram into buggy mode. I'll admit it made me very tearful that another 'tiny baby' part of his babyhood was over. But he was bored in the pram now, quickly getting fed up at being led down and wanting to be able to see more of what was going on around him when we were out and about. He is very happy with buggy mode! 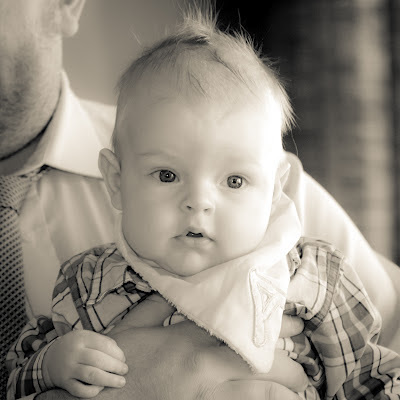 The most important milestone this month was Xander's Dedication Day. A day that allowed us to celebrate the blessing that he is to us, to say thank you to God for his safe arrival, to celebrate that our baby boy came home and how much we love him. To say it was a special day is an understatement. The service was just perfect and everything we wanted for him. Alexander did us proud as always, being a happy little chap and smiling in all the right places! Of course he was very spoilt. Thank you lovely people, I promise I will get around to individual thank you notes very soon. With our birthdays and his dedication he has had lots of opportunity to practice present opening. At Christmas he wasn't really at all interested when I was opening his presents with him, now as soon as a present is put infront of him he is clawing at the paper to have a feel and when he gets hold of a bit he actually pulls at it to rip it! He definitely knows the routine now and you can see his anticipation to get going! Haha! He is so clever! You may notice in the photograph this month that Xander's hair is getting lighter and lighter. I can't believe how dark his hair was when he was born compared to the difference now. It was already getting thinner but he has had pretty bad cradle cap this month and in the process of treating it even more of his hair has come out. He looks almost bald in places but that is because the newer hair coming through is white blonde! Jon and I were fair as small children so this change isn't entirely surprising but I was a bit alarmed how much hair was losing and a bit sad; I've always loved his hair with his cute little spikey mohican on top and I hope it all grows back! Maybe it is because his hair is getting lighter and blonde, but I'm sure his eyes are looking bluer and bluer to. My handsome little man! Well I think that is month five well and truly covered, can you believe the next update will be his half birthday blog?! Gorgeous boy - my son was dark haired at birth and then it fell out and went white blond, not what his half indian mother was expecting at all! Now at 3 its a darker blond in the winter and gets very light again in the summer. It sounds like Xander is doing the same stuff as Baby Girl, I too am excited by it all but sad that she is growing so fast.